Trump doubled down Thursday on his harsh trade rhetoric targeting China. President Donald Trump spoke to two groups of Americans on Thursday on opposite sides of the tariff debate. In Illinois, Trump spoke at a steel mill that has reopened and brought back hundreds of previously laid off workers because of the tariff on imported steel. 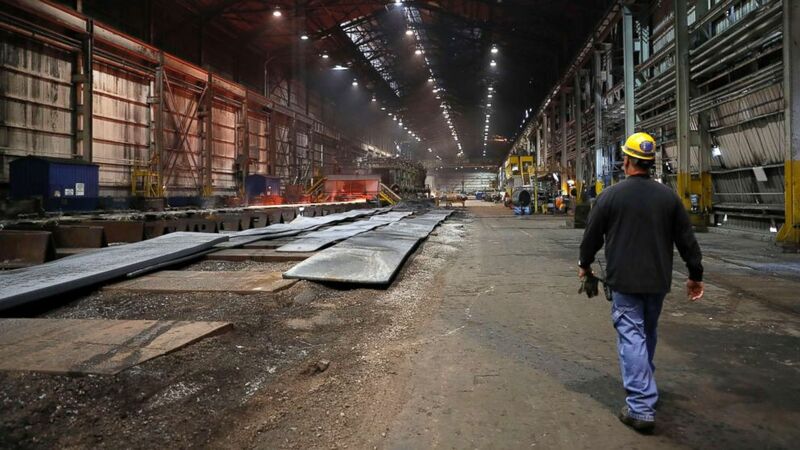 (Jeff Roberson/AP, FILE) In this June 28, 2018, file photo, a worker walks inside the hot-strip mill at the U.S. Steel Granite City Works facility in Granite City, Ill.
"After years of shutdowns and cutbacks today the blast furnace here in Granite City is blazing bright, workers are back on the job and we are once again pouring new American steel into the spine of our country,” Trump said. In Iowa earlier in the day Trump assured farmers feeling the fallout from his trade war that he has achieved major gains in bringing countries to the negotiating table with threats of tariffs and doubled down on some of his tough rhetoric targeting China. "China is doing a little number, they want to attack the farm belt because they know the farmers love me," Trump said. "And I said they're not going to win, just so you understand. We have all the cards, we're going to win." 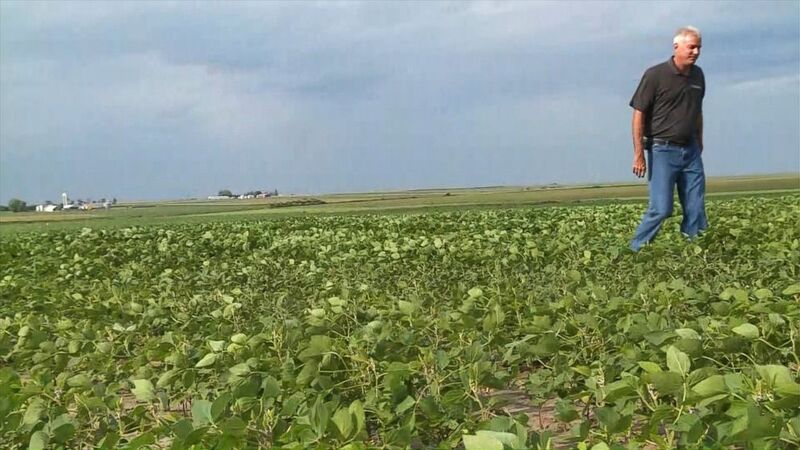 Speaking with ABC News Wednesday, farmers across the state said that Chinese retaliatory tariffs have already caused major losses for their operations. 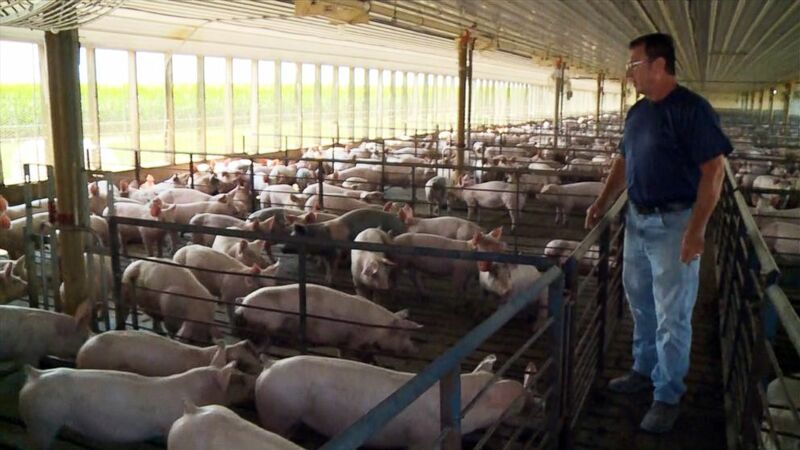 One hog farmer said he estimates tariffs are costing him about $25-30$ per pig, while corn and soybean farmers have faced a 15-20 percent drop in the price of their harvests as well. Speaking on a workforce development roundtable at the Northeast Iowa Community college, President Trump was confident in his defense of his trade battles, slamming past "worst-ever made" past trade deals reached between the U.S. and other countries. (Alex Mallin/ABC News) Farmers face a nearly 20 percent drop in the price of soybean harvests this year and more than 15 percent drop in the price of corn, according to the Iowa Corn Growers Association. The new tariffs are seen as the primary cause. "We don't have one trade deal that's good," Trump said. Trump has previously said that the retaliatory tariffs are unfair and that he is prepared to tax even more goods imported from China. He announced on Wednesday that he reached a deal with European Commission President Jean-Claude Juncker to prevent any further tariffs on European cars. "We just opened up Europe for you farmers, you're not going to be too angry with Trump," Trump said. The administration also announced $12 billion in emergency aid for farmers this week. (Alex Mallin/ABC News) Gregg Hora of Fort Dodge, Iowa, says farmers are anxious about the financial impact of a protracted trade war. "Patience is wearing thin on U.S. pork producers because the next six months of market prices -- there's a lot of red ink," Hora said. According to the U.S. Trade Representative website, countries comprising the European Union already "rank[ed] 1st as an export market for the United States in 2016," with the EU countries ranking fourth as an agriculture export market for the United States. During the panel Trump lavished praise on Republican Iowa Gov. Kim Reynolds, who in April when the tariffs were first unveiled announced her opposition to the move, saying, "nobody wins in a trade war." In Granite City, residents and business owners who spoke to ABC News said the new activity at the mill has created a sense of optimism and excitement around town. “You’ve been through a lot the last few years, and we gotta start it up and stay up,” U.S. Steel President David Burritt told the audience before Trump arrived. “We can do this, we can have steel that’s mined, melted and made in the USA,” he said during the rally.